A tingling punch in the nose is what fresh horseradish delivers, which makes it the perfect accompaniment to smoked, oily fish. My horseradish plant didn't survive the trip from Johannesburg to Cape Town, so I was overjoyed to see fresh roots (which look like spindly parsnips) in my local supermarket. Quite fortuitously, I managed to get my hands on some lovely local cold-smoked tuna, which is produced by my fellow food blogger Sam Linsell of Drizzle and Dip. Sam's a partner in The Smoking Shed, an artisan-producer of a variety of cold-smoked foods and spices. Smoked Tuna with Fresh-Horseradish Cream, Pink Pepper and Herbs. If you're on a low-carb diet, leave out the caster sugar. This recipe is suitable for anyone on a low-carb, #LCHF or diabetic diet, but please leave out the caster sugar. If you've bought a whole horseradish, you'll need only a little of it for this dish. It's worth grating the whole root, however, and putting it in a jar with olive oil and salt (here are my instructions for preserving horseradish). Or you can wrap what's left over and put it in the freezer: it keeps remarkably well, and can be grated over food straight from the freezer. If you can't find fresh horseradish, use a little of the creamed variety. Scatter the tuna with tiny baby herb leaves and sprouts. Put the sour cream and caster sugar in a small bowl and stir in two teaspoons (or more, if you'd like it stronger) of grated horseradish. Season with salt and set aside for fifteen minutes. Stir well. Slice the tuna into ribbons and arrange on a platter, or on individual plates. Scatter the leeks, herbs, sprouts and pink peppercorns over the fish. Drizzle over the olive oil and dust with black pepper. Serve immediately, with the horseradish cream and some lemon wedges. 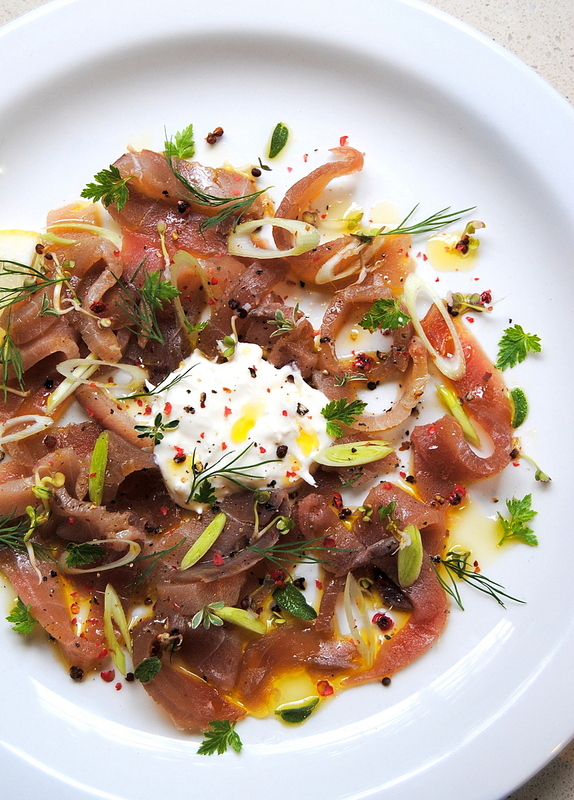 Wow - what a stunning and inspired recipe and flavour combination for our smoked tuna. Thank you so much! I cant wait to give it a bash. ps a lovely photo too! I just HAVE to get some of Sam's smoked goodies! Lovely lovely pic you have too. Great flavours. Horseradish and smoked tuna just seem a natural pairing - like sashimi and wasabi. Any ideas you (or twitter followers) might have on where to find fresh horseradish in CT? The bottled stuff isn't the same, unless you have secret facecloth-in-cheap-vinegar cravings. Best pic yet - balanced, simply styled, inviting. Sam, Michael and Steve: thank you. Steve, my fresh horseradish came from Checkers in Hout Bay. Not half as skanky as it sounds. Well done Jane, you have once again created a masterpiece here. I am off the Checkers to grab some horseradish, my plant also did not survive!!! The photograph makes me wish I could eat my screen! That looks incredible! That is quite an inspiring dish and those flavours sound amazing! Elegant and inspiring- want to try out your horseradish cream. We have a BEEEG horseradish fan in the house! Lovely presentation Jane-Anne! I'm not the world's biggest fan of horseradish, but that smoked tuna plus my growing wasabi peanut addiction might warrant a second chance for it to win over my tastebuds. definitely eye candy ! and what a taste combination !I love horseradish and will never ever buy ready made again.. thanks for the recipe !